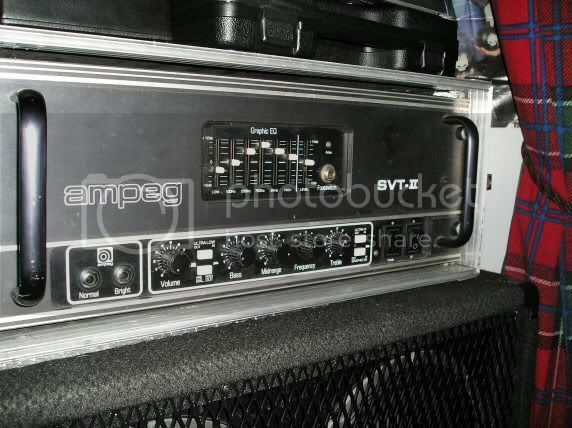 Legend BP102-4 Bass Driver The 4 ohm speaker Ampeg currently loads in their 4x10 and 8x10 bass cabinets. I'll soon be throwing four of these into a Trace Elliot 4x10 speaker cabinet that's built like Fort Knox (the drivers failed long ago). They handle 200 watts each, and I'm hearing that might be a conservative estimate. A perfect match for my beloved Ampeg SVT-II rack-mount amplifier head. Bring on the booty, Rootie Au Vootie. Fender Acoustisonic DSP 30 Amplifier Cover Do I need to explain? Ampeg SVT-II bass amplifier head If you'd like to loosen some cavities, this is one way. I got mine for a steal in 1991, and will never sell it. If I ever see another one of these selling (relatively) cheap, I'll pick it up. You might want to leave a little more rack-room for cooling than shown in this photo (not mine).